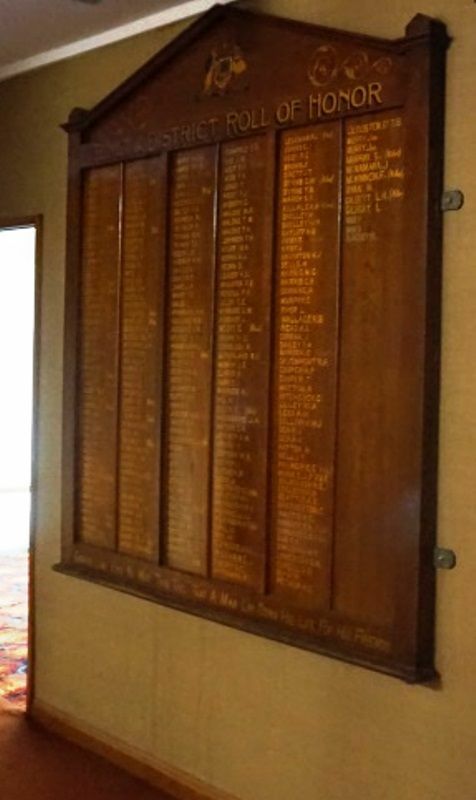 A wooden honour roll commemorates those from the district who served in World War One. The roll was originally unveiled in 1916 with additional names being added to the roll at later dates. 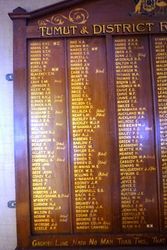 The unveiling of the Tumut and District Soldiers' Honor Board was effected under the aegis of the War Service Committee at the Post Office, where it hangs, on Saturday afternoon. The ceremony was a very impressive one, mixed witb pride, enthusiasm and sadness — the pride of those whose sons and relatives have gone to the front to fight for freedom and liberty, the enthusiasm of those they have left behind to protect the dependents and the sorrow of those who have lost dear ones in their efforts to help win this cruel war. Our Federal representative, Mr. Robert Patten, came to Tumut especially for the occasion, and delivered a capital oration. 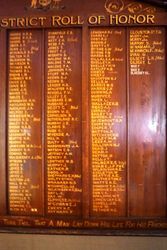 The Honor Board was shrouded with the Union Jack and the badge of mourning for the dead whose names were emblazoned thereon, hung beneath. A string of our national and Allies flags floated from the trees alongside the footpath, and altogether the tout-en-semble presented an imposing spectacle. The only disadvantage was that the Honor Board, from the position it occupies, was obscured from view of the thousand people who came to witness the. unveiling.